TORONTO — Their partnership began some 11,000 kilometres from Toronto, on a concrete court under a corrugated metal roof in Dakar, Senegal. Ryerson Rams coach Roy Rana and his team were there in the summer of 2017 to help at the SEED Project's Hoop Forum, an annual event for Senegal's top high school players that's as much a cultural festival as basketball camp. Tanor Ngom was a seven-foot-two teen with NBA dreams. Rana decided to help get him there. "I've never had the opportunity in my career to coach a kid of this potential here in Canada," Rana said. "It is a partnership. Him and I are in this together ... Dream the dream and go try and make it happen." Ten NBA players — including former Raptors Pape Sow and Mamadou N'Diaye — hail from the West African nation of 16 million. And while the NBA's Basketball Without Borders and Masai Ujiri's Giants of Africa program continue to inject money and support, hardscrabble courts and makeshift gyms remain the norm. But an oft-quoted 2011 Sports Illustrated story surmised that a seven-foot American male has a 17 per cent chance of making the NBA. And so, while that report raised some eyebrows since it was published, in a game that places a premium on size, Ngom had won the genetics lottery. Rana hadn't actually seen Ngom, who's now a sophomore at Ryerson, play before the Senegalese centre landed at Pearson Airport just over a year ago. He'd been nursing an injury during their serendipitous meeting in Dakar. "We went and picked him up at the airport, and he was every bit of seven foot two," Rana said. "Even though I'd seen him in Senegal it was so long ago so you think, 'OK 7-2, but he's probably 6-11.'" They arrived at Ryerson's residence around 3 a.m., but couldn't get in. So Ngom spent his first night in Canada sleeping at Rana's house. Ngom was on the court the next morning. "Right off the bat, I was like 'Wow, we've got something pretty special here,'" Rana said. "He was 198 pounds, tiny, but he was fluid. Athletically for a guy that size, he doesn't move like a seven-footer, he moves like he's 6-8, 6-9. "Most seven-footers are a bit clunky, but here's a guy who had a bit of grace to him." Ngom's been on a steep learning curve since his arrival. "The first year he would literally spend more time on the ground than he would in the air, because he'd fall down after he'd jump all the time, he was so thin, his balance was off," Rana said with a laugh. "We would joke about that. He's improved tremendously in all aspects of the game, mentally, physically, his skills, he's starting to find himself a little bit as a centre as opposed to trying to just stand around on the outside and shoot." Ngom is averaging 13.8 points a game on 65 per cent shooting. His career highs are 24 points against Algoma earlier this month, and 11 rebounds (twice last season). In August, Ngom became the first Canadian university player to participate in the elite Nike Skills Academy in Los Angeles. He held his own against Bol Bol (the Oregon Ducks' 7-3 centre and son of Manute Bol) despite his limited basketball background. "He has natural God-given skills, he changes things on the court consistently, he has good jumping ability, he's not just a 7-2 basketball player, he's an athlete," said coaching legend George Raveling, a Basketball Hall of Famer and Nike's global basketball sports marketing director. "And so that puts him in a different category right away." The camp's star-studded coaching staff included LeBron James, Paul George, Bradley Beal, Kevin Durant, and Ngom's favourite player Anthony Davis. "It was unbelievable. I'm still shaking just thinking about it," Ngom said, flashing a megawatt smile. Ngom pulls out his phone and scrolls to a photo. In it, he's dunking. Durant is at the top of the key, eyes peering up at the rim. "I was starstruck. I looked at (Durant) from afar, I couldn't talk to him," Ngom said, his long limbs folded onto a stool at Ryerson's Mattamy Athletic Centre. "I couldn't even take a picture with him. And then he walked off the court and went home and I was kind of sad. Then Anthony Davis walked in and coach said 'You're not missing this opportunity.' He took my hand said 'You're taking a picture with him,' so I took a picture with him." He has that picture blown up on his wall. 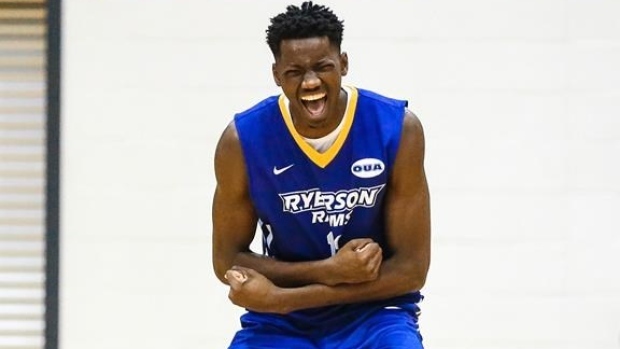 Less than a week later, Ngom drew kudos in Ryerson's pre-season game against the NCAA's top-ranked Duke Blue Devils in Mississauga, Ont., throwing down a huge dunk from the weak side, and blocking a shot by Canadian phenom R.J. Barrett. "That dunk against Duke really opened a lot of people's eyes," Rana said. "He's dunking the ball like an NBA player in U Sport, with force and just his ability to go up and bring it back behind his head," he added. He is already drawing attention with a Golden State Warriors scout attending a recent Ryerson game. Ngom can enter the NBA draft this year. As an international player, he can enter and withdraw from the draft three times. Sudanese centre Thon Maker jumped straight from playing high school basketball in Orangeville, Ont., to go 10th overall to Milwaukee in 2016. Saint Mary's product Will Njoku was the last Canadian player to be taken out of a Canadian university in the modern-day two-round version of the NBA draft, picked 41st overall by Indiana in 1994. Will Ngom be next? Raveling thinks so. His athleticism lends itself to today's trend toward positionless basketball. "Time is both his ally and his enemy," Raveling said. "But if I'm sitting in a draft room, I'm looking at the limited exposure that he has to the game and how quick he's narrowing the gap. So someone will have to draft him with the idea that 'We're going to be patient, but our patience will be rewarded.'" Growing up, Ngom — who was 6-3 by age 12 — was focused on school. But his school's coach came begging when a player went down with an injury when Ngom was 14. That game led to an invitation to a Basketball Without Borders camp. His dad forbade him from attending. "I went anyway," he said with a laugh — his mom gave him the green light. "I stayed the whole weekend and it was hell. It was very hard. Because all of those guys were playing for so long, they were so strong. Imagine me at 14. I'm skinny now. Imagine me then. It was horrible." Several NBA scouts were in attendance when Ngom scored just two points in the camp's all-star game — a dunk on a local star named Ibrahima Fall Faye. Unbeknownst to Ngom, his dad was in the crowd. Someone had called and tipped him off. "Afterward he said 'Is this what you really want to do?'" Ngom said. "He understood. He said if this is what I wanted to do, he would invest in me." The next few years were a whirlwind of playing club basketball in Spain and Germany, where he worked with Holger Geschwindner, Dirk Nowitzki's former coach and mentor. He went months without seeing his parents or five siblings. He hasn't seen his mom in almost two years. But Ngom, who has a seven-foot-five wingspan, is enjoying life in Toronto. "I saw the players and we just clicked directly, J.V. (Jean-Victor Mukama) especially, because he speaks French," said Ngom, who's fluent in English, French, German, Spanish and Wolof. "They just became family from the jump, it was very special." Rana coached Canada's U19 team to World Cup gold in 2017, is currently the head coach of Canada's men's team for World Cup qualifying, and coached the World Team at eight straight Nike Hoop Summits. Wherever Ngom's path leads, the coach says it will be a success story. "Obviously we want him to play at the highest level," Rana said. "But there will be no failure here. Whether he plays in the NBA or doesn't, there's no failure, this kid is going to be a very, very successful man. "For now, he's just this great kid who ended up Ryerson, and we're dreaming this dream together." Lori Ewing's Canadian basketball report will be published every Tuesday. Note to readers: This is a corrected story. A previous version incorrectly stated that Ngom can become the first player drafted out of a Canadian university. Will Njoku was drafted out of Saint Mary's in 1994.